The films of director Joe Dante have taken us to some strange places a mysterious Chinatown antique store in Gremlins; a secluded resort populated by werewolves in The Howling; even deep inside the human body in Innerspace. But now he takes us to the strangest place of all surburbia! Family man Ray Peterson (Tom Hanks) is looking forward to a week of putting his feet up at home in the quiet, leafy cul-de-sac of Mayfield Place. But his plans are scuppered by the arrival of new next-door neighbours, The Klopeks, whose behaviour and habits are more than just a little kooky. But things go from kooky to downright sinister when local old boy Walter disappears, leading Ray and his buddies to suspect their new neighbours of killing and eating him! Sure, the Klopeks are a strange bunch what with their digging up the backyard in the middle of the night but they re not devil-worshipping cannibal killers... are they? 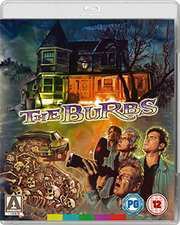 If you re looking for a knowing slice of tongue-in-cheek terror then look no further than The Burbs. A standout horror comedy from a director who has given us more than his fair share of fun frighteners, The Burbs assembles a superb cast including Tom Hanks, Bruce Dern, Carrie Fisher and Corey Feldman in a tall tale of small-town terror. You ll never look at those eccentric neighbours in the same way again! The original Workprint cut of the film transferred from Director Joe Dante s personal copy, on home video for the very first time - includes deleted and alternate scenes!